A group of strangers become trapped in an elevator. Six strangers trapped in a lift and one of them is not ‘Mr. nice guy’ – sound familiar? It should, as it's pretty much the same plot as 2010's Devil, only not as scary.. or as clever… or as well acted… or as, well, good basically. Of course, Devil had the benefit of M Night Shyamalan and his intriguing view of the world to skew the basic plot; he also added slowly revealed layers of insight into characters and a story arc that acted to both keep you watching and keep the protagonists on their toes. 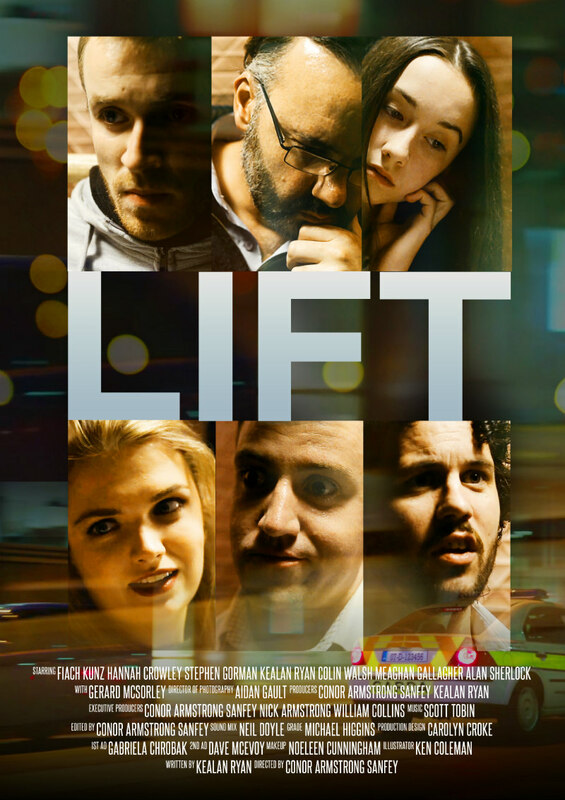 If Conor Armstrong Sanfey, who directed Lift, has not seen it, I suggest he does, just to gain some insight into what-might-have-been. This film centres around anti-hero Sean, seen at the beginning of the film attacking a security guard in an anonymous white collar building before ducking into an elevator full of unsuspecting plebs on their way home or to the pub. Sean presses the STOP button and the next thing you know they are all stranded and trapped in the elevator with a guy who they all just saw violently assailing someone. Needless to say, this is cause for some concern. Onboard the chosen lift are father and daughter duo Frank and Sofia, better known as claustrophobic/hypochondriac dad and token child. There are also bro-pals Jay (scriptwriter Kealan Ryan) and Mick, aka self-appointed lothario lad, and his bland and nervous but obvious ‘nice guy’ friend. Along for the ride is pretty girl/love interest Fiona. 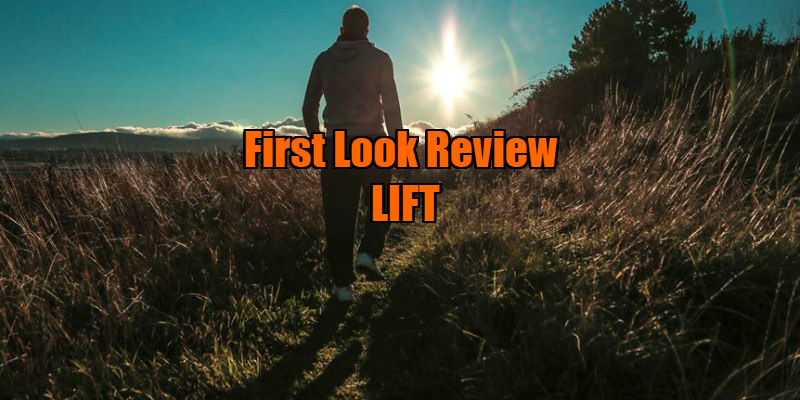 There is banter and some ‘danger’ scenes in the lift as flashbacks to Sean’s recent past with his grandfather reveal his motivations and concerns about his crime. They play a game of Irritating Things Done In Movies (such as never paying cab fare etc), which I have decided I definitely must play with my friends. There is some vomiting, talk of bladders and farting - the usual bonding stuff. Does the good guy get the girl? Does the bad guy get redeemed? Does granddad get better? Will everyone survive? Will there be some kind of group hug and lame joke? I’ll let you take a wild guess. This is a film as unsure of its genre as it is of its audience, and therefore fails to fulfill the promise of any genre. This is a film that thinks it is saying something important, but between clichés and melodrama it fails to impart much of anything we haven’t heard many times before. The screenplay by Kealan Ryan is littered with truisms and banality; these characters are never believable, with the lion’s share of issues falling into the camp of nice guy Mick (Stephen Gorman). Perhaps the character wasn’t up to nuance (and the script hardly allowed for it) but he is an un-endearing pompous whiner who clearly the audience is supposed to root for; but being both bland and annoying, he can only dream of earning our sympathies. It must be said however that the camaraderie among the characters is well played and Sean does develop nicely as his story is eked out very, very slowly throughout the course of the film. Fiach Kunz as Sean gives the best performance here. Unfortunately Gerard McSorley, as the grandfather, seems to think he’s hosting PlaySchool, and his over pronunciation and efforts at being ‘lovable’ are ultimately just irksome (not to mention that he seems to only have one outfit, as that’s pretty much all we see him in regardless of the many changes in scene). The problem with McSorley is the same problem with the movie; it just wants to be liked so damn much that it misses the edges and depth that give films their texture and bite. The filmmakers need to concern themselves more with making a good movie, rather than a likable one.